Florence Nightingale Wins 2017 Golden Halo! The Supreme Executive Committee of Lent Madness heartily congratulates Florence Nightingale on winning the 2017 Golden Halo! To celebrate this momentous victory, the SEC has commissioned Lent Madness hymn writer extraordinaire, Sister Diana Doncaster, to pen a hymn for the occasion. Enjoy! Joyful are the ones who voted for our Florence Nightingale. Joyful more the ones whose lives and health she guarded without fail. Joyful are the ones who’ve followed in her noble nursing ways. Joyful we who still are learning how to live strong in our faith. Florence won the Golden Halo long before Lent Madness came. Faithful to her call to service, faithful to Christ’s healing grace. Longed to serve the church, but sent home, went forth into battle’s roar. So we offer God our praises for such saints who’ve gone before. With the saints who’ve taught us well that lived love is all God requires. None are perfect, all have struggled, all have learned the ways of Grace. May we fumble in their footsteps, ‘til we meet Christ face to Face. What’s nearly as important as announcing the Golden Halo winner? Sharing the Lentorium link to the winner’s swag! Click here to pre-order your very own Florence Nightingale 2017 Golden Halo Winner mug (stethoscope sold separately). Blessings to all as we head into the Triduum and enter into the death and resurrection of our Lord. It’s been a privilege to have you join us on our Lenten pilgrimage! 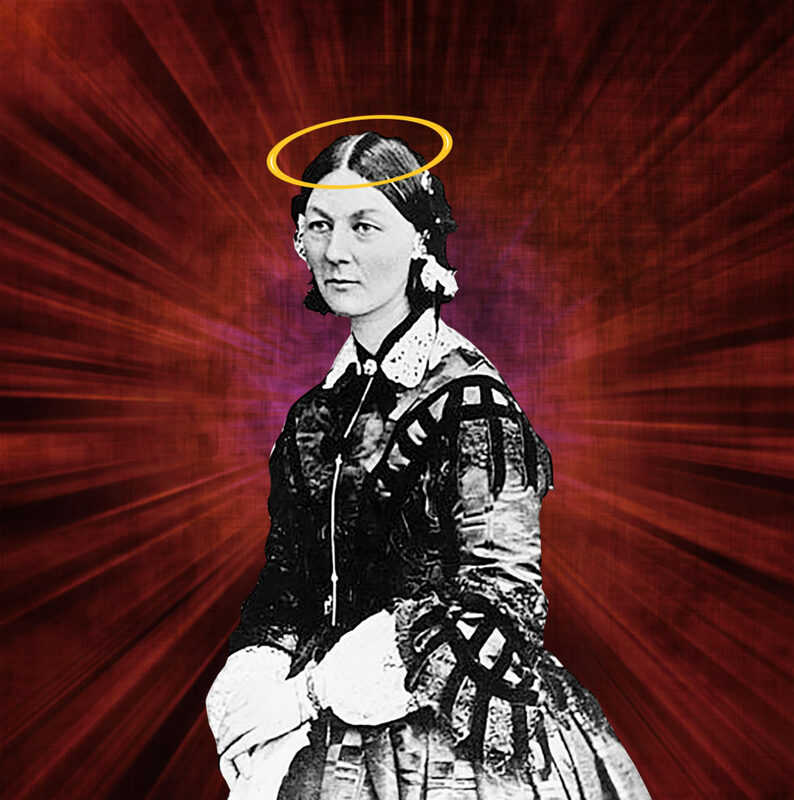 150 Comments to "Florence Nightingale Wins 2017 Golden Halo!" Great fun and I learned a lot. Don’t think I chose even one winner, except Flo at the end. Guess I’m a supporter of the underdog. This has been the most disappointing season ever. I think it could be the Lent Madness has lost its mojo. Peace and Blessed Triduum to you. We once had “mojo?” Thanks! You still got the mojo! You are the Mojo Masters! Thanks for another great season of Lent Madness. We appreciate the Supremes, the celebrity bloggers and — newly this year — Hymn Writer Extraordinaire Sister Diana! You still have mojo! Great season – I learned a lot, thanks! And this is one Pentecostal that will definitely be back next year to do Lent with you Episcopalians. How about William J. Seymour (preacher at the Azusa Street Revival) in the bracket next year? This Lent has been pure blessing for me. Not sure what mojo is, but joy and blessing, laughter and learning, extended community – oh yeah! Don’t despair Mo and Jo still love you! Peace, brother. Again, I think the SEC is enlarging our category of “saints,” and while that may be uncomfortable–and discomfitting–at first, I think we will grow because of it. I hope we may all come to experience wild joy in encountering such a diversity of saintliness in our world. I believe LM may truly be a “thin space” because of that stretching element. I had great fun reflecting on all the lives that were brought before us and learned a lot. Thank you, Lent Madness, from a big fan! I always have a wonderful time reading and learning about the saints. Some of whom I knew about and mostly those I don’t know. I look forward to Lent Madness each year…. I agree–but I still learned a great deal about the “candidates”. So here’s to 2018–!!! Thanks for all the information. I always learn so much through this madness and look forward to learning something new everyday. Florence has been a hero to me since I was little. My Grandmother was a healer before doctors were around in her area so praying and doing what one can has been a lesson learned early. I am looking forward to next year. The celebrity bloggers outdid themselves, they get better every year! Congratulations Flo! And let us not forget the winner of the silver halo Franz Jägerstätter–who most of us had never heard of before this Lent! May each of you have a Holy Maundy Thursday and Good Friday, and an Easter filled with joy!!! Hurray for Fabulous Flo – a tribute to all nurses past and present, the nursing profession rocks!!! Thank you, Tim and Scott, for another inspiring and thought-provoking Lent Madness. It keeps me engaged in Lent and also teaches me about saintly souls I might never have heard about. Congratulations to Florence. Happy Easter to all. I’m with Jane. Thank you so much, SEC and all my “Madness” brethren! A silver lining to Franz Jägerstätter losing is that he will participate in a future Lent Madness season. I am looking forward to reading more about him and introducing him to new Lent Madness followers! And a Silver Halo this year as well. I’m glad for Flo and even gladder to have learned about Franz and all the other dark horses this year. Thanks for this delightful way to attend to Lent, SEC and Celebrity Bloggers. And a special round of applause to Sr. Diana for her wonderful hymns! To all, have a blessed Triduum and a glorious Easter! May we learn from her example! Thank you Diana the hymn writer. Thanks be to God for the imagination, dedication, and humor that go into creating Lent Madness. All the the bios are calls to humility and service. I have been blessed by every one of them and by the comments which have enlarged on the information in the bios. I would be equally blessed if we didn’t vote, but just let the SEC toss a coin to decide each contest. However, then we would lose the satiric edge. Since I am not a sports fan I rather enjoy dethroning Bis Sports for a season. Thank you all! It’s been a joy being part of this Lent community. Thank you to all. This is one of the reasons I’ still an Episcopalian. It has been a fine Madness, and just as mojo-laced as ever in the eyes of many beholders. I hope all the fans of Florence and Franz will move on to Fifty Days of Fabulous, a daily dose of inspiration and interaction for the season of Easter. Thanks to all for sharing thoughts, laughter, tears, and faith. Bless us, one and all. Many thanks to Scott and Tim and all involved with Lent Madness, I looked forward to it every day. Education and fun all rolled into one! Franz Jägerstädter may not have won this year’s contest, but his quiet example of doing what is right when all around are not is something that I will remember. The frog does not have to die a death by slow degrees if he is alert enough to recognize the pot and flames for what they are…and then jumps. For me the real value of saints is what they teach, and while Florence certainly has much to teach…Franz is teaching me. And frogs. Frogs should be listening to Franz. “I” too “SWYDT.” All the Pepe the Frogs should be listening to all the saints and learning something about grace and tolerance and community. Integration is here to stay, and immigrants are a protected class for Christians. (You’re subtle, Miss Jan, but I have to draw out meanings more fully.) “Mojo” means going out and making the world a better place, and I think LM served that purpose this year. Thank you all. I am grateful for the arrival of Lent Madness each year! Thank you, Tim and Scott for inventing and promoting Lent Madness. I look forward every season to live with and learn of our heritage through our Christian ancestors. Thanks to all the contributors whose imagination and research bring us together. I appreciate all the commentators whether I agree with them or not. God is Good, God Bless Us everyone. Easter Blessings and Praise Father, Son and Holy Spirit. Amen. Another great hymn, Diana! I especially like the lyric “May we fumble in their footsteps”. It reminds us that, on this side of Heaven, our walk with Christ will never be perfect, but we still travel a holy way, as Florence and Franz, and all the saints before us have done. Good to travel to Canterbury with you again this year, Harlie. See you next year. Have a great one. Thanks, Celia. A blessed Triduum and a glorious Easter Season to you! I saw your post just as I was walking out the door, so I only had time for a short response, but I would like to expand on it. Celia, I appreciate your well considered comments, your responsiveness to other commenters, and the civility and respect you to show to all. Plus, I love the way you refer to Lent Madness as “Traveling to Canterbury”. That just warms my lil’ ol’ Anglican heart! Harlie and St. Celia, I have enjoyed our conversations and look forward to next year! This year’s Lent Madness has been wonderful, Susan. I loved your “Mythological, Schmythological!” Have a radiant Easter! Thanks to all for your humor, scholarship and fun. geaux Flo! as we say here in New Orleans. or we might spell her name as FLEAUX. I loved the hymn and sang it in my head. But we don’t want to spell her name FLEAUX because that means “scourge” in the French singular (with an accent on the “e”). Why it keeps throwing the extra code in I don’t know. But I’ll figure it out for next year. Y’all have a good one. Will the Lentoriium have a Franz Silver Halo Kite? Or a silver halo pint glass like St. Bridget’s? Hooray for Florence. Thank you SEC. Many thanks to the SEC! We here at Xavier Catholic Middle School are concerned about Oliver. We’ve not seen him post in a long time. Where oh where is Oliver?! That being said we thank you for an exciting Lent Madness season! I’m missing Oliver too. Praying all is well with him and his family. And that they and all the Lent Madness family have a beautiful Triduum. I do miss Oliver Age 9, and hope to see comments by Oliver Age 10 in Lent Madness 2018. Thank you to all concerned! This was my first year of Lent Madness and I thoroughly enjoyed it. I learned a lot and was entertained along the way. Well done and I’ll be back for more next year! Sadly, I could not bring myself to vote yesterday. I could not choose between these two brave souls. Both stood their ground for their beliefs. I vote for a tie. Indeed and well said. Though my heart and vote were with Flo, I can certainly see your point. Another fun and informative season AND what a terrific hymn. What fun to see Flo make it all the way through to the Golden Halo! It takes a lot of inspired wisdom to save lives with soap, vinegar, and fresh air! Even though I am an RN, NP. Joyful indeed! I have followed Lenten Madness for several years and THIS YEAR I finally picked the winner from the start. Being a Nurse, in my mind, Flo was the only choice from the beginning. Once again I have met and learned so much about Saints/saints I never heard of before and for that I thank you. Now it is the dismal wait until nest year …. sigh! It seems just right that on Maundy Thursday a disciple willing to wash the feet of others and follow the commandment that we love one another should be crowned with the golden halo. My nine year old twins and I have enjoyed this so much. That is, SEC! While I did vote for Franz, Florence is a wonderful example to all of us. What about a Franz stein? You did it for Bridget… Thanks for a wonderful Lenten season of learning about people who followed our Lord no matter what. I had Franz early in Lenten Madness, as Vegas had him winning as well. Lot of collection basket money lost. I am kidding and my normal alms will be there this week. In all seriousness, this was my first one, and it was fun. I had the book, but the daily posts on here were worth the price of admission. Great fun, congratulations to Florence Nightingale, and I look forward to 2018! which should be sung at least once this Easter season [in honor of today’s victory], on August 12, her Episcopal saint day, celebrated for a short time but now put on hold, and as many times as Lutherans allow! May Beethoven hear loudly and clearly these new sweet lyrics, which will even bring a smile to Flo’s ‘tired from nursing’ face! Thanks to Tim and Scott and all their volunteer staff who brought many odes to joy to many Lent Madness fans throughout Lent! And to Sister Diana for her daily saint hymn lyrics! And now, I return to sermon writing! Thanks for such a fun way to learn the saints! It gave me something to look forward to each morning. Even though it was my first time, I did pretty well and won with Flo! My church’s intern, who was responsible for bringing this Lent Madness to our attention, kept track of everyone’s bracket sheets and announced I had won the most picks. He presented me with the purple Golden Halo mug which I use every morning and am tickled to have it! I can’t wait for next year!! I have thoroughly enjoyed this year’s LM, even though Franz–my pick from the beginning–only captured the silver! In the very first round I only missed two of the choices, but it was a steady, if gradual, downhill slope from then on. But I have been missing Oliver and wondering what happened to him. Do we know? Thanks again for a fun ride–and a blessed Easter to all! Flo wins!!!! Can’t think of a better person to win it all! What great time for nurses and caretakers everywhere. Oh…he disappeared! Where did he go? He’s still around. I saw him post yesterday. Just not quite as active this year. Many thanks SEC, celebrity bloggers and all who support Lent Madness. This has been a bleak feeling Lent for me so I’ve been especially grateful for the inspiring and cheering message of Lent Madness. I’m very happy to see Florence in her well-deserved Golden Halo. She not only exemplified the faith, love and service of Christianity at its best, but she was a revolutionary in her insights to improve caring for the ill and wounded, and a tactical genius in finding ways to implement them. Sandy, I will keep you in my prayers, that God will sustain you in this “bleak feeling Lent”, and grant you peace. May your Easter be joyous. I think you should update this hymn as a more general hymn on the subject of being inspired by the saints. Thanks for a wonderful Lenten season of learning and fun. Have also enjoyed spreading the word about Lent Madness to many friends, who now have become converts! A Blessed Easter to all! As a first timer to Lent Madness, I can tell you that it is fabulous! Our church, Advent Lutheran in Morgan Hill, CA, joined in and we’ve kept a big chart posted in the social hall, updated every day! Thanks for the wild ride and the thingsvthat I’d never would have learned without you!!! Thank you for a wonderful season of Lent! This is the first year I faithfully voted for ever single contest, and I feel I learned so much! A little disappointed that Franz didn’t get the golden halo, but, yes this does mean he’ll be back next year, and Florence, too, is a wonderful saint. (I voted for both multiple times). Thanks, and see you next hear! I should add, but only once in each bracket! Thank you for a wonderful Lent Madness! This was my first and I will definitely be back again in 2018. May you all have a very Blessed Easter! Congratulations, Flo! And thanks to Sister Diane for the festal hymns to go along with Lent Madness this year. Blessing to the SEC, Celebrity Bloggers, Diana!, first time visitors to Lent Madness and groupies. Yeah! we begin voting next year around Valentine’s Day, which happens to fall on Ash Wednesday. Diana, your poetic hymns have been amazing. Thank you for sharing your gift of poetry. I hope that the SEC presents you with a Florence Nightingale Golden Halo mug filled with kisses and a pound of good coffee. And some can be found in history’s lines. But God poured out Grace anew. Each has a gift to give. Did this one even live? For God pours out Grace anew. What makes a saint? We might justly ask. Leave us scratching our heads. Love is shown in fact or in mystic haze. But more in unending Grace. Oh, Diana! That is wonderful. Diana, I’ve enjoyed your hymns, and today’s two hymns are a perfect way to end Lent Madness this year. This is perhaps my all time favorite hymn, courtesy of my beloved, sainted, British mother, who sang it as a child. Your version is just as lovely and relatable as the original! Thank you Diana! What a blessing your poems and hymns have been. Diana – your hymnody and rhyming would have delighted my mother, who was a 50+ year church organist, English/Latin major. She could whip up a 20+ paragraph poem in honor of a friend who was retiring, celebrating a choral concert, etc. in a day. Blessing and cheers to you for this lovely reminder. She is smiling, too. Can’t wait until next year! Thank you so much for you hymns during Lent Madness. I have waited each day to read your words (and to see if I could sing the hymn without any help from The Hymnal!) Perhaps we shall meet one day, ‘while at tea’. Thanks to excellent bloggers (as always) and to Fr. Tim and Scott for an outstanding Lent Madness. My stepmother, a favorite cousin and two granddaughters, all nurses. I’m so glad Florence won,? A blessed Holy Week and Happy Easter to everyone, and thanks to the SEC. Have a good year, everybody! I’ve loved Lent Madness ever since I discovered it a few years ago. This year was great for so many saints new to me, and so many match-ups that allowed the more obscure saints to advance at least one round. Thanks to all who made that possible. By the way, I was just looking at the Wall of Fame and the bracket record for 2016 does not appear to be there. Can this be corrected? May God richly Bless Sister Diana for sharing her wonderful gifts with all of us. May God Bless all of You who walk in His ways. May you all have a joyous Easter. I thought this was the best Lent Madness since I found it (even though I normally picked the underdog). It was a real learning experience. Diana, I hope you are planning to continue writing your hymns. They truly added a new dimension. Joyous Easter to all. Sister Diana, Thank you for another charming hymn. This is a well earned golden halo and represents just one more example of Florence’s impact. It has been a blessing to patricipate! Lent Madness gives me great meaning. I learn, I enjoy, I agree, I disagree. I have loved Diana’s hymns this year. Go, Flo! Looking forward to 2018. Or maybe “looking to forward movement”. I’ve dabbled in Lent Madness for a couple years, but this is the first time I feel a true sense of poignant loss that it’s over! I’m truly going to miss you guys – Scott and Tim and the celebrity bloggers. Blessings to all. Blessings on Diane for her creative hymn writing. Although my selections did not win, I deeply enjoyed her literary expressions. Thank you SEC! I can hardly imagine all the work that must go into this madness, but it has touched me deeply the last two years, and I believe that must be true of many others as well. And so much fun!!! I will miss it so much, but look forward to Ash Thursday, 2018. Blessings to you all! Would it be possible to do a covered cup or a water bottle in addition to the mug? For many of my beloved nurse friends,they have to have covered beverages in their places of service like the hospital or clinics. Thank you for such an educational Lent! Why do you include some candidates from previous years ? How do you go about picking Those ? How can you so devilishly pick two for a day’s voting that make it so hard for us to pick just one ? Most Awesome that my Golden Halo pick won!! Florence was a really wonderful smart woman who was so sensible about cleanliness being the key to not getting infections. Such an easy thing to wash your hands. The rest of my bracket was busted except for Florence. This was my first time playing this and it was super fun. Really enjoy the SEC – you guys are so much fun. I am a brand new Christian and am being baptized on Easter Eve – I’m so excited I can barely stand it! Excited for my bracket next year! Blessings to you Laura, and welcome to the family! See you next year (and don’t miss the 50 Days of Fabulous during Eastertide…Laurie Brock and her cohorts do a fabulous job!). Blessings to all for a holy Triduum and a glorious Easter. Florence looks so sad on her Golden Halo mug! Wish she looked a little happier! Thanks to ALL! Including everyone who takes the time to make a comment. I learn so much from you all. Happy Easter! Another inspiring Lenten Madness Season! I have been especially moved when one commenter says he or she is sick or distressed in some way and subsequent commenters offer consolation or prayers for the distressed one. A real ministry. Thank you all, dear SEC, fabulous Celebrity Bloggers and all in the Lent Madness Global Viewing Public…it has been a blessing being with you this Lent. See you all next year. This was my first Lent Madness and I am hooked! What fun to learn about the saintly people of yore. Thank you for the lessons of life and the spirit. It brings us all closer to each other and God. Sister Diana, thank you for all the new hymns this Lent. Wishing you and your Community a Blessed Easter. This was my first Lent Madness and I really enjoyed it. I picked a lot of winners. I had a really hard time at the end. Even though I voted for Franz, I thought Florence would be great also. Great fun. Thank you. Congrats Flo! What an educational and fun Lent Madness season it’s been. I’ve learned so much about all these fascinating saints; I feel I know them. Blessed Triduum to one and all. See y’all next year! It’s been a wonderful journey! Thank you to the SEC, the Bracket Czar, wonderful Celebrity Bloggers, Sister Diana, the staff at Forward Movement, the Lent Madness Global Community/Commentariat, and all the saints. https://www.youtube.com/watch?v=zJMy9JMxMUc Have a Blessed Holy Week and a Joyous Easter! And …. today, one of the TV networks here in Australia broadcast “The Lady With a Lamp” (1951) as its lunchtime movie. Coincidence, or …..? Way to go St. Flo! I would love to be able to show my fellow nurses Flo’s latest and GREATEST achievement with a cool water bottle! Thanks to Flo’s insights into infection control we can’t have open containers on the unit. Thanks to one and all for your passion, creativity and appreciation for all Crazy Christians ( as Michael Curry calls us:) ! This was my third year to enjoy Lent Madness after it was first introduced to our church. I look forward to it every Lent and an disappointed when it ends. Keep educating us and entertaining us. Happy Easter! Thank you for doing Lentmadness. What a wonderful way to learn about the saints. Can’t wait for next years. I am happy Florence won as I have a sister who is an R.N A granddaughter in law who is a Nurse Practitioner and several nieces who have varying degrees in the nursing profession. I look forward to year 2 for me next Lent. I love this new hymn and sang it as I read her wonderful words. Keep up this wonderful tradition! Worthy winner! Nobody I voted for won their bracket this year – new record of picking the losers! The hymn also goes to the Battle Hymn of the Republic – refrain “Florence won the Golden Halo (x3) we praise God for her faith”? You made me laugh when you wrote of your “new record of picking the losers!” I dared to hope that Moses the Black would go all the way to the Halo, but alas…And even though I voted for Franz in the final battle, I knew he wouldn’t win. As a resister of the Nazis, he was just too similar to last year’s winner Bonhoeffer. A joyful Easter to you! Thank you so much to everyone who worked on this Lent Madness-so fun and informative. I’m sorry Stephen didn’t make it, but ultimately voted for Florence. A blessed Easter to all and see you next year. I seem to be alone. I will continue to return today, hoping for one last comment. I cannot yet let the Madness go. Good morning, Harlie. A blessed Holy Saturday to you. My heart and ears are still ringing with the power of Tenebrae last night, the ancient Psalms, the gathering darkness, the great crashing, dissonant chord that tells of all Creation in grief over the death of Jesus, and the single candle, promising the return of the Light. Good morning, Diana! So good to hear from you. Cool that you should speak of Tenebrae. We did it for the first time here at our parish. Very powerful. At the end, the Ministers bowed to the altar and left, but the congregation didn’t move. They sat there in silence for a surprisingly long time, in prayer and contemplation. I’m guessing we’ll do it again next year, eh? Our normally chatty congregation also stayed in silence, left in silence. There are times when even the most eloquent must fall silent before holy mystery. There’s nothing like good Liturgy. I grew up with the idea that written prayers and ritual were just “empty ceremony”, but that’s not true, that’s not true at all. When Liturgy is done well, with faith, God touches us. Even when it’s poorly done, the Spirit manages to slip in through the cracks if we’re willing. Oh, yes. So what’s next for you today (and tonight)? We’ve got the Great Vigil at 6:30. This year we’re doing all nine Lessons (count ’em, nine! ), besides the Epistle and Gospel. I think this may be another first for us. AND we’ll have large enough congregational candles that we won’t have to blow them out after the Exultet. Of course, how we’re going to juggle a service bulletin, a hymnal, and a candle remains to be seen, but I think people will like the longer lasting candlelight. Just home from a GLORIOUS Easter Vigil (only 4 lessons compared to your nine. 9 requires serious stamina and, as you noted, serious candle power. I got to preach, we had a baptism, the choir sang the Beethoven Hallelluia – two services tomorrow after which I will either float off into the skies in sheer bliss or, more likely, come home and take a very long and blissful nap. btw, I bought Franz Jaggerstatter’s letters from prison and am finding it rich reading. So glad you had a great Easter Vigil. We did too. Sue preached last night as well. Perhaps when we come out to visit in June we can arrange to be there when you preach. As for the candles, I was a bit worried that it might be awkward holding one and turning pages at the same time, but it worked out fine. Beethoven’s Hallelujah I’m not familiar with. Will definitely google it. What’s the title for Franz’s prison letters? Today Sue has two more service, I have one. Afterwards we’re going to an Easter buffet at a local restaurant, and then home for “a very long and blissful nap”. We’re both retired, so each day of Easter Week we’re going to do something celebratory: attend a play, go out to eat, visit a museum, etc. I also bought “A.D. The Bible Continues” for us to watch over the Fifty Days. It didn’t get very good reviews from Rotten Tomatoes, but I don’t care. I want to see some Jesus Action! Well, I better go have breakfast. I can have sugar in my coffee now, every day! Thanks. Just listened to Beethoven’s Hallelujah, while eating. Beautiful! To anyone who may read this, Happy Easter Monday. The second day of Easter always finds me with mixed feelings. Oddly, I have a slight sense of loss after Holy Week, Easter Eve, and Easter Day has been concluded. For the past week I have spent my evenings at the church, in the company of my fellow believers, reliving those mighty acts of God whereby salvation has come to all people and Heaven and Earth made one. After the joy of Easter Day Mass and the following celebrations, Easter Monday can have a touch of sadness, since there will no longer be that intense nightly spiritual, emotional, and communal experience. Those parishes that have Mass on the days of Easter Week are truly blessed, but most churches don’t have the number of clergy required to do this. In the average parish, by the end of Easter Day, the priest(s) and deacon(s) are exhausted and need Easter Week to recover. Throughout the Fifty Days of Easter we strive to maintain that sense of wonder and joy in our Lord’ triumph over sin and death. In Christ’s Resurrection is our resurrection, in his victory is our victory. Happy Easter Monday to you, as well and I hope you have a blessed Eastertide! Thank you so much for Lent Madness. I learned a lot form each post. I appreciate the work (and fun) that the two of you put into making it something to look forward to everyday. I am certainly looking forward to next year and as we will have a new priest I am going to see about drumming up interest to make it a parish endeavor. Blessings to all who participated! Congrats to Flo…but what about Franz? My friends and I are waiting to see what swag will be offered featuring this year’s Silver halo winner, Franz Jaggerstatter! Well, I think I may have run out of comments, at least for the time being. I do think our Silver Halo winner deserves a Pint Glass or something. . . .
Off to see “Jesus Christ Superstar” as part of our Easter Week celebration. A Happy Easter Wednesday to all! Today my wife and I went to our favorite Mexican Restaurant (best in Chicago), then we took our dogs to a garden store and bought a couple of plants. This latter activity might not sound too festive, but we enjoyed it, and the dogs loved it!